Put all ingredients in the bowl and mix on low until combined. It makes a great spread for sandwiches, crudites, anything really. Bright and salty, but mild and creamy. Just delicious. Let me know how did you like it. I hope you are having a great Monday. 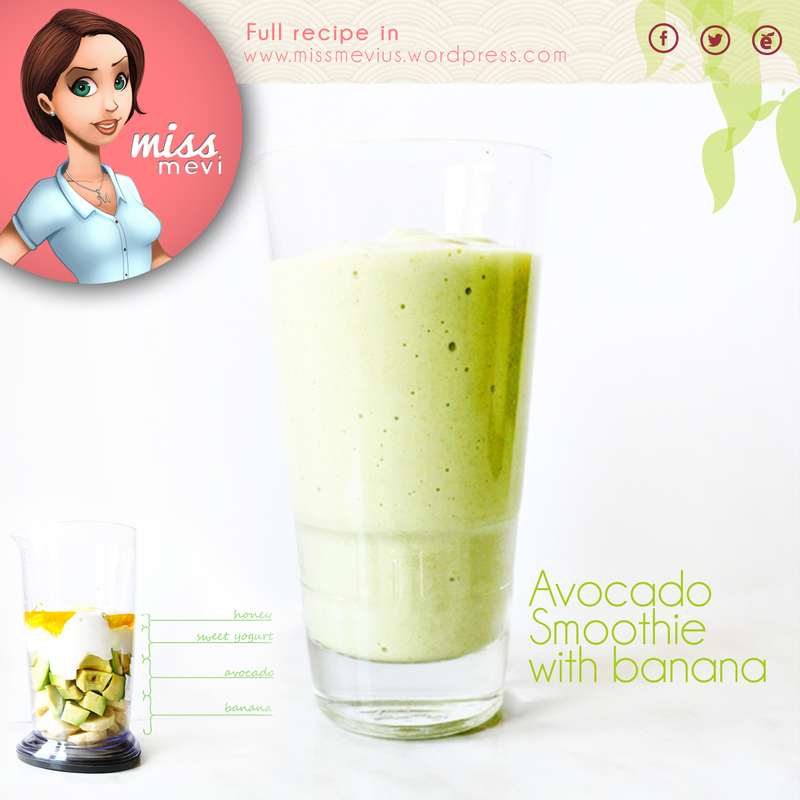 To make the avocado cream, crushed avocado with lemon juice and salt until you have a puree or cream. Cut bread in half and spread each half generously with avocado cream. Add a layer of shredded beef or pork pork sandwich. Add some pickled onions and aji criollo over the meat. Easy to prepare and delightful! As usual, please share with us all how did you like it and send pictures once you serve it. Chicken salad with balsamic cilantro dressing. December just arrived and this year 2014 is almost gone. Are you ready for all the December celebrations? Today I’d like to share with you this delicious chicken salad. Yield: For 1-2 as a starter salad, for 1 person as main entrée salad. To prepare the salad dressing, place the ingredients in a small bowl and whisk lightly. Can be made ahead of time, refrigerate until ready to use. 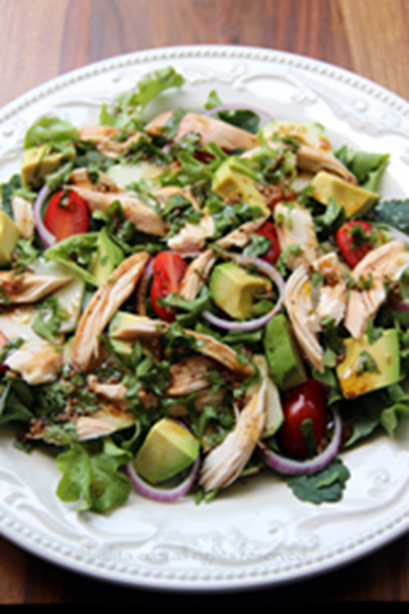 To prepare the salad, arrange the mixed salad greens on a large plate, add the diced avocado, tomatoes, red onions, cucumbers, shredded chicken, and the chopped cilantro. Pour the balsamic cilantro dressing over the salad, toss and serve immediately. Please share with all of us how did you like it, and send us pictures to see how you served it. This is a very easy to make and very fresh salad. With a small knife or “shark”, cut the little stem end out of the tomato using a serrated knife, cut the tomatoes into 1/3 inch slices. Slice the mozzarella 1/4 inch thick. 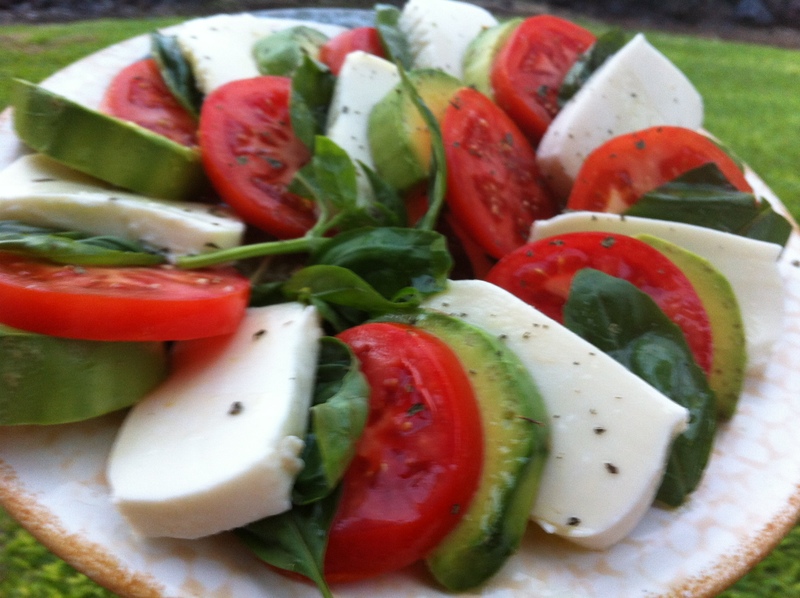 Alternate slices of Avocado, tomato, mozzarella and basil leaves like playing cards on individual plates. Drizzle on the olive oil and vinegar. Serve with Italian bread or baguette (French bread). 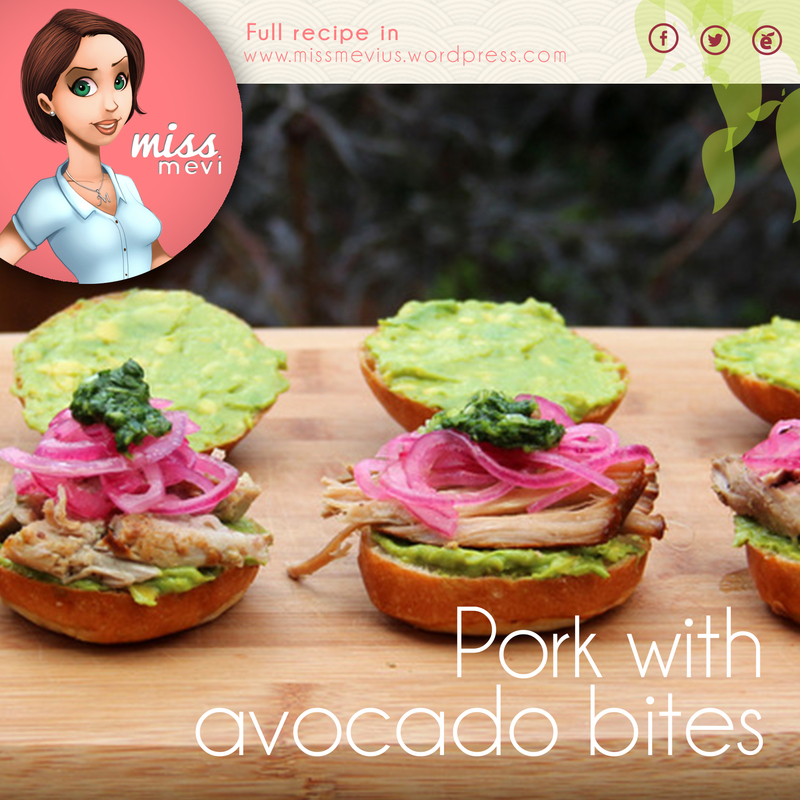 You can also serve them on a brochette. Please provide us your feedback, let us know if you enjoyed this. Here is another stuffed avocado recipe, this one is stuffed with a shrimp salad made with red onion, radish, bell pepper, celery and cilantro aioli. 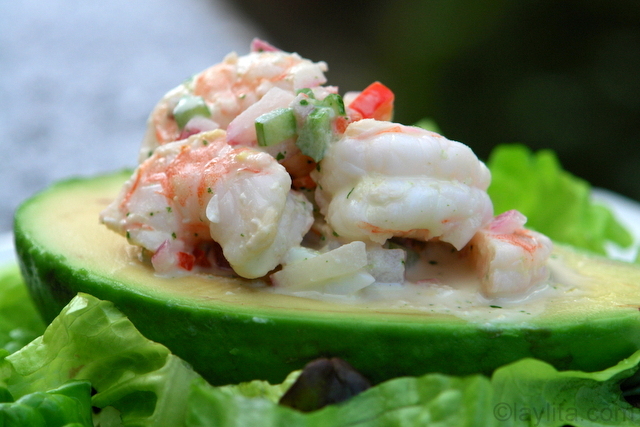 The first time I had a shrimp stuffed avocado was at the beach in Punta Carnero (Ecuador). It was so simple, yet delicious and refreshing, I’m sure the shrimp were fished that same morning. There is nothing better than fresh seafood, unless you pair it avocado (of course). I was about 8 or 9 at the time, so I don’t remember every single ingredient in it, but I figure I can experiment until I achieve the perfect shrimp stuffed avocado. Nico’s improvement suggestion was to make it spicier, but since I have a two year old testing the recipe as well I served the aji or hot sauce on the side. 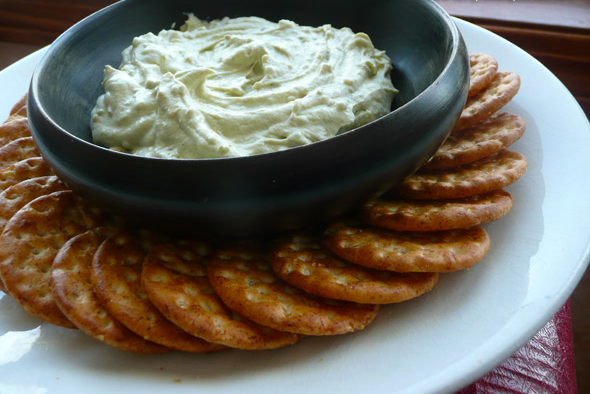 This can be served alone as an appetizer, or with lettuce and tomatoes as a salad. The shrimp salad filling can be prepared ahead; however, the avocados should be cut and peeled right before serving to avoid darkening. The shrimp salad is also excellent on its own and also makes a great filling for sandwiches.